“What does he want for Christmas?” my mother asked. “All he wants is money,” I replied about my son, 15. Grandma would not be deterred, however. Surely I could give her gift ideas besides cold, hard cash? Our conversation motivated me to think up the suggestions below. Many of you may look at it hoping for some sliver of enlightenment about what to get your teenager for the holidays. While I have no exciting revelations (such as a must-have Tickle Me Elmo toy for the teen set! ), I humbly suggest the following. My son, 15, loves ice hockey and tickets to an NHL game would be exciting. If a top-tier professional league is too far out of your price range (trust me, I know it can be), then check out local “farm” or college teams. You can usually get a better seat at a better price. Meanwhile, my tween loves the theater. Tickets to a touring production of a Broadway play would thrill her. Interested in some extreme experiences as gifts?! Like a trip to the Galapagos? Then check out this amazing collection of experiences I wrote for Your Teen for Parents. Dream big, right? We’ve all been there. Your teen wants the latest gadget, whether that’s a new gaming console or the hottest phone. But if these aren’t budget-friendly, then don’t forget little items like new ear buds or cord wrappers. 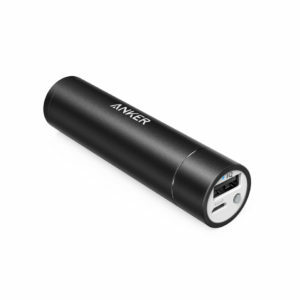 One of the most practical gifts my son ever received was a portable phone charger. Costing less than $20, it was not only a little something to open Christmas morning, but it has proved useful many times over. You’re scratching your head wondering why I’d put household items on a teen’s gift list. But does your teen have a suitcase or duffle bag that will see her through a class trip or visits home from college? Or a practical, but handy, toiletries bag? Last year I bought my teen a cushiony foam mattress topper. While not as thrilling as a new iPhone, it makes him happy and his bed is “super comfortable” as he says. Check Etsy for unique gift ideas related to your teen’s current interests. When my tween fell in love with the movie The Greatest Showman, I scoured the stores for merchandise and saw none. I found a t-shirt from Etsy printed with her favorite saying from the song “This is Me”. She wears it weekly. I have also found distinct gifts related to Bigfoot (don’t ask) and the video game Fortnite on Etsy. Of course there are video games to give your teen, but what about a board game? Last year our tween received the game of Clue. We spent the whole month of January playing as a family. 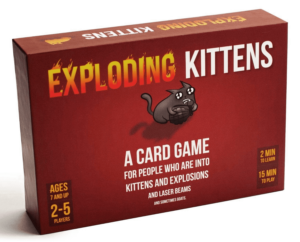 New games are constantly gaining buzz, too, such as the Exploding Kittens card game. I’ll ask Grandma to get that for my son this year. Give your teen a monthly subscription box for a gift that keeps on giving all year long–or just a few months if you so choose. Subscription boxes aimed at teens come with makeup, socks, jewelry, young adult novels, and pop culture trinkets among many others. There really is something for everyone. This is a classic gift idea for teens because it is hard to go wrong. Teens love gift cards in all shapes, sizes, and denominations. Think gift cards for gas stations, movie theaters, gaming platforms for in-game purchases, as well as clothing stores they frequent. So if all your teen asks for is money, don’t be dismayed. You can always wrap up some cash or a check and your teen will be ecstatic. 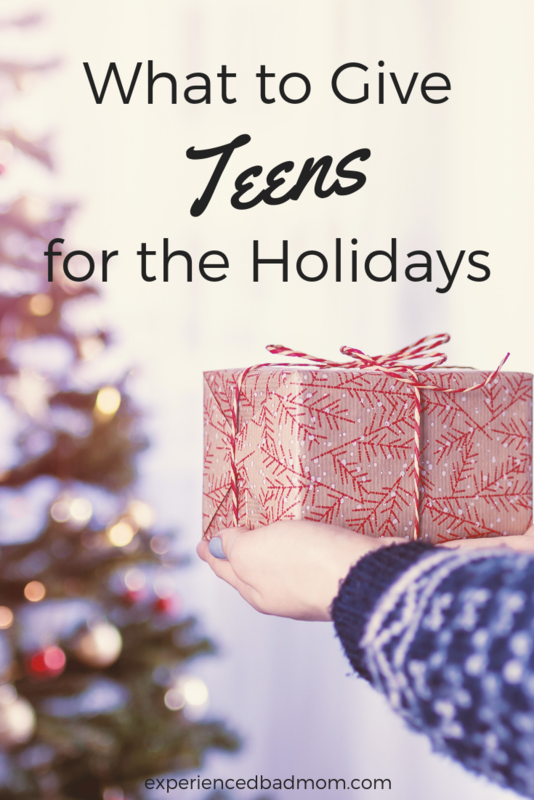 But there are other gift ideas to consider that may make your teen’s holiday merry and bright as well. Exploding Kittens! Now that looks like just the perfect ticket for everyone never mind just the teens. As do all the other gems you’ve listed, Katy. I’ve spotted several items that’ll be perfect for our 96 year-old’s stocking … Bless you. After you give Exploding Kittens a whirl, we’ll have to compare notes. I was a bit underwhelmed when I received the tiny package from Amazon. Here’s hoping it’s big fun! I have that portable phone charger. I just love it. I have a 14 year old boy, and it has been hard! He is awesome, but is very little help in coming up with ideas. I think I should get him a mattress topper! They just want money and gift cards, don’t they?! Sigh. Merry Christmas!